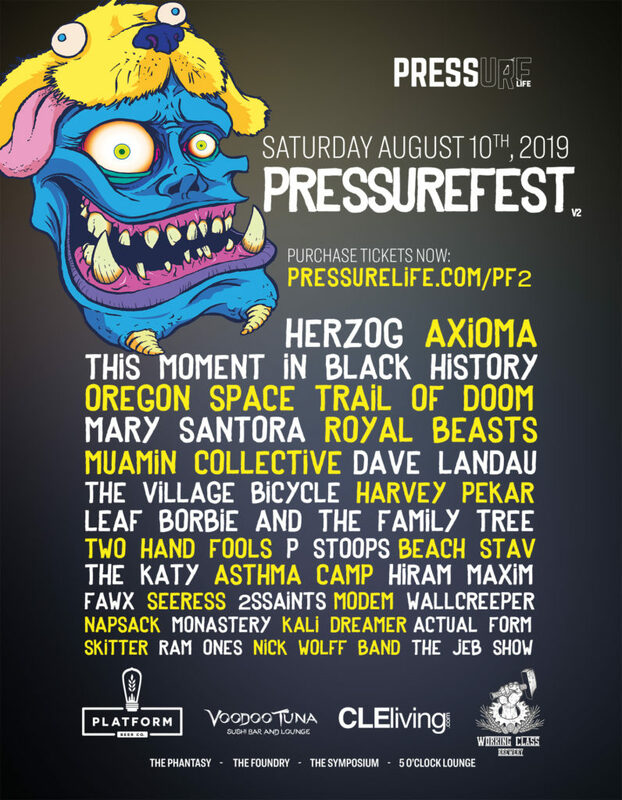 Pressurefest V2 is the go to festival for up and coming Cleveland bands and classic mainstays. A very easy to walk four venue gathering between The 5 O’Clock Lounge (CleLiving Stage), The Phantasy (Platform Brewery Stage), The Symposium (Voodoo Tuna Stage), and The Foundry (Working Class Brewery Stage) on Detroit Ave in Lakewood, Ohio by W.117th street. Join us for our exciting new additions this year; The Phantasy, The Symposium transformed into a purely comedy stage curated by Best Cleveland Comic Mary Santora, multiple amazing vendors and new wristband perks. Wristband perks are an incentive to get more people involved in the festivities. For example our friends over at LBM will be offering a quick eats menu only for PressureFest concert goers. We hope to be adding many more perks as the day gets nearer. We are very excited for this year and we hope that you are too. Thanks for the continued support of PRESSURELIFE Magazine and PressureFest!